Officers from Fairfax County (VA) Police and the Norfolk Southern Railroad Police have been cracking down on people who illegally walk across railroad tracks Northern Virginia. The Norfolk Southern Police are in the midst of a year-long Trespass Abatement Program and are focusing their efforts on five areas in Fairfax County in recent days. That is due to the high number of injuries and deaths in these areas in the last 24 months. The Norfolk Southern Police stated that there were three train track crossing fatalities involving pedestrians last year. Two of them were under 18. This year, there have been no deaths, but one juvenile was injured by a passing train when he was illegally crossing the tracks by foot. A major trouble spot is near Old Burke Lake Road. There, hundreds of students from Lake Braddock Secondary School cut across the tracks. Many of them are wearing earbuds and cannot hear the trains approaching either. 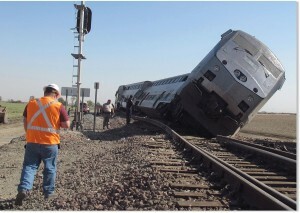 Our railroad injury law firm has experience with many of these tragic train accidents. And we have seen plenty of railroad accidents that were the fault of the railroad company. In many cases, the railroad company does not have properly functioning lights and gates at crossings, which can lead to injuries and fatalities. 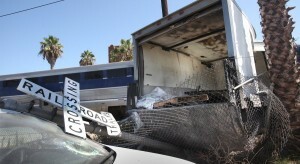 There were 637 train related deaths in the US in 2008, and many of them were pedestrians struck by trains.If the railroad companies would ensure that that the lights and gates at crossings are always in good repair, and they ensure that train engineers obey all safety regulations, these types of accidents would happen less often. Trains don’t always run on a precise schedule, so it is never ‘safe’ to cross a railroad track unless it is at a designated crossing. Of course, it is highly dangerous and illegal to walk on railroad tracks at any time. Do not make the assumption that you will hear the train coming. Many modern trains are much quieter than in past years. Walking across a train trestle is highly dangerous and illegal. There have been dozens of deaths at train trestles over the years. Don’t become part of those sad statistics. A new report issued by the Government Accountability Office this week states that Congress should allow more time for freight and passenger trains to install new technology that could prevent deadly train derailings, such as the Amtrak mishap last May that killed eight people. Congress established a Dec. 31 deadline for rail companies to install new crash prevention technology, which is known as positive train control. 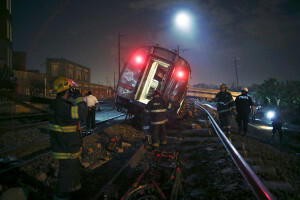 This technology was developed in 2008, after a train accident in California that killed 25 people. The new GAO report found that most railroads will not meet the end of the year deadline. It noted that there have been delays in the installation of the systems. For example, the technology is still being developed and there are only a few suppliers. Also, the federal government has added to the delays. One reason is that railroads had to cease construction on railroad tracks with radio poles because there had been no environmental evaluation process. The report further noted that the Federal Railroad Administration did not provide enough oversight. It took the FRA seven months to review the initial safety plan that was turned in from a railroad. Railroads that do not have positive train control could have federal fines and other punishments if they do not have the new technology by the end of the year. Our railroad injury law firm in Virginia applauds the efforts to improve train safety across the country with the installation of positive train control technology. It is likely that if that technology had been on board the Amtrak train last May, the train could have been slowed down enough automatically to avoid tragedy. Anyone who has suffered a serious injury from a train derailment usually benefits from speaking to a personal injury attorney. We had a $60 million derailment settlement a few years ago after a train derailed and severely injured a man in his workplace. A section of railroad track that was owned by CSX in Lynchburg, Virginia (VA) was set to be replaced – the day after a crude oil trail derailed and broke out in flames. The National Transportation Safety Board issued this report in late August into the derailment, which occurred on April 30, 2014. The Lynchburg oil train derailment required the evacuation of hundreds of people from downtown. The NTSB still has not determined the precise cause of the wreck, but should by the end of 2015. NTSB documents state that the derailment happened at a break point in the track, which means that the rail section was cracked or severed. The break was only a few inches from a repair that was made in January 2014. The day before the oil train derailed, an inspection of the track section showed there was an internal flaw in that same rail piece. So, CSX planned to replace a 40 foot section of the rail, which was going to be installed on May 1, 2014. The derailment is one of about nine oil train derailments that have happened in North America since 2013. The biggest and most tragic was the derailment in Lac Megantic, Quebec in July 2013 that killed 47 people. 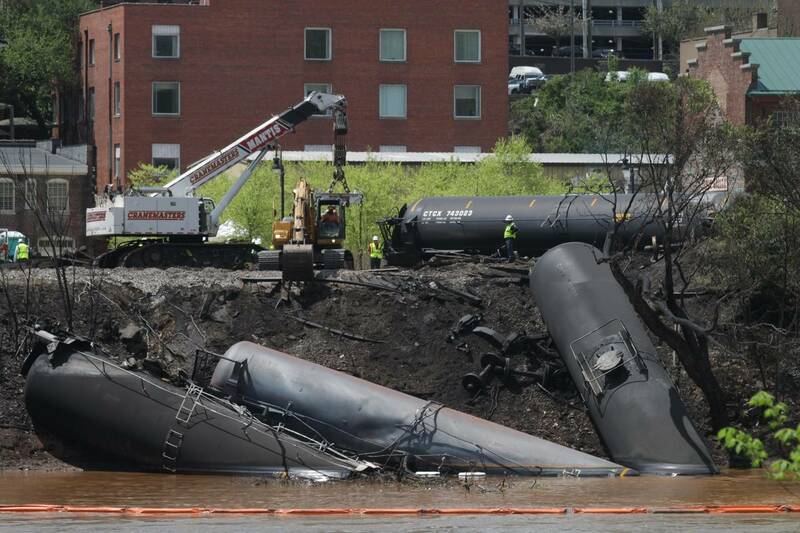 In Lynchburg, 17 oil tank cars derailed, with three plunging into the James River and one caught on fire. Our Virginia railroad accident law office has extensive experience in train accidents and derailments, as well as railroad crossing accidents that were due to train engineer or railroad company negligence. These often preventable mishaps can lead to injury and loss of life, although we are glad the Lynchburg incident resulted in no injuries. We have represented workers who have been injured by railroad company negligence in the past, such as a CSX conductor who was exposed to asbestos fibers in his work for decades. That case resulted in an $8.6 million verdict. We hope that CSX and other companies in the industry will put a better focus on safety – both for the safety of the public and the environment. A box truck driver jumped to safety just seconds before an Amtrak train slammed into his vehicle in San Diego CA on Aug. 31. The wreck happened in San Diego near the intersection of West Washington and Pacific Highway. The box truck had part of its cargo bay over the tracks at the time. The local police reported that the light turned red on Pacific Highway but the truck was unable to move off the tracks due to traffic ahead of him. The construction company truck was hit by the train just seconds after the driver jumped out. The truck spun into the opposite lanes of traffic and tore off a utility pole. Two other cars were hit, but no one was injured. The cause of the accident is being investigated. We as railroad accident attorneys in Virginia know all too well the devastating accidents that can occur at railroad crossings across America. The Federal Railroad Administration reports that cars and trains hit each other every 12 minutes, which led to 9600 train/car accidents in 2009. Maintenance problems with the train or rail system, which can include defective brakes on the train. Drowsy train engineer; about 34% of all car/train accidents involve some type of human error on the part of the train or car/truck operator. Distracted train engineer – Some accidents occur when the engineer is talking or texting on a cell phone. Safety gate failure – Some gates malfunction and stay up, even when the train is coming. So, a car can get stuck on the tracks. Our railroad accident lawyers are experienced in reviewing all relevant evidences – such as train cameras, black box recorders, and signalization information – to see if there were any malfunctions that caused the accident.